Earlier this year, Toyota took the wraps off the Prius C Concept; a supermini-sized, “fun to drive”, high-mileage hybrid car designed to appeal to young singletons and couples. 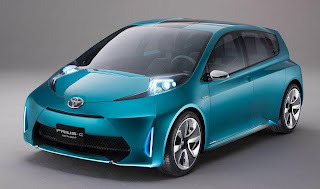 Following numerous spy photos, reports out of Japan suggest that Toyota's new supermini hybrid will be substantially cheaper and more fuel-efficient than the larger Prius. The Prius C, Aqua in Japan, will be $4,000 cheaper and 25% more fuel-friendly than the current Prius. To trim development costs, Aqua will utilise the same hybrid set-up found in its larger sibling. On the Japanese 10-15 test cycle (extra urban/highway), the car is able to achieve 94mpg. In comparison, the Prius obtains a 75mpg figure on same cycle, so the Prius C/Aqua is more or less 25% more efficient, meaning it will achieve an EPA highway rating of more than 70mpg. The Prius C/Aqua will launch in Japan in January 2012 before hitting U.S showrooms mid-2012. For Europe, Toyota will release a Yaris Hybrid at the same time.